Shark attacks and sewage slicks, lifesavers and surfers, amusement parks and beach camps – the beach is Sydney’s most iconic landscape feature. From Palm Beach in the north to Cronulla in the south, Sydney’s coastline teems with life. People around the city escape to the beaches to swim, surf, play and lie in the sun. 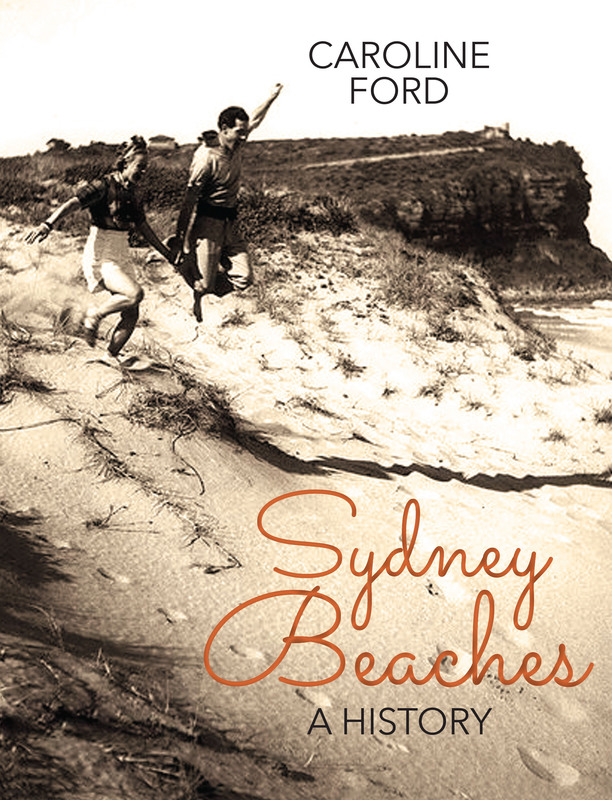 Sydney beaches tells the story of how Sydneysiders developed their love of the beach, from 19th century picnickers to the surfing and sun-baking pioneers a century later. But Sydney’s beaches have another history, one that is lesser known and more intriguing. Our world-famous beach culture only exists because the first beachgoers demanded important rights. This book is also the story of these battles for the beach. Accompanied by vibrant images of Sydney’s surf, sand and sun worship, this expansive and delightful book is the story or how a city developed a relationship with its ocean coast, and how a nation created a culture. Interview with Robbie Buck, 702 ACB Sydney. 6.20am, 27 January 2015. Interview with Daniel Healion (podcast), 2Ser radio. 8 December 2014. 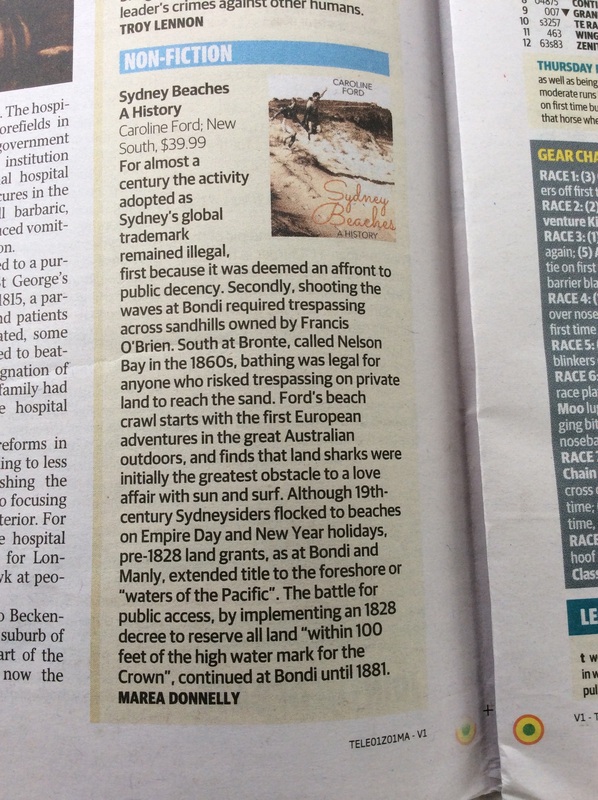 Sydney Beaches in history, Australian Geographic, 24 November 2014. 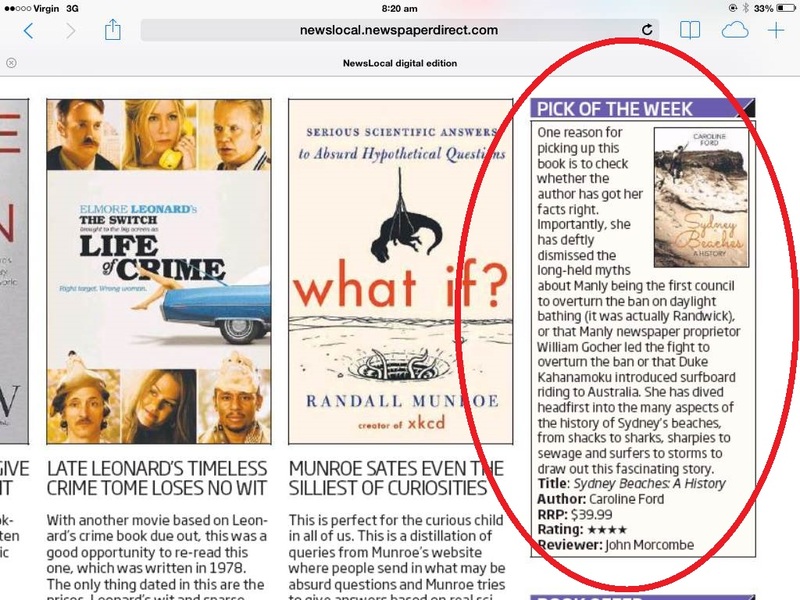 ‘Beach histories laid bare’, St George and Sutherland Shire Leader, 28 October 2014. Interview with Phillip Adams (podcast), Late Night Live on Radio National. 15 October 2014. And stlll the fight continues to keep our beaches public at Little Manly.